Deepak Ray, Institute on the Environment. The Green Revolution has stagnated for key food crops in many regions of the world, according to a study published in the Dec. 18 issue of Nature Communications by scientists with the University of Minnesota's Institute on the Environment and McGill University in Montreal, Canada. 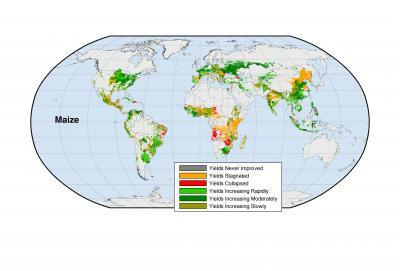 Led by IonE research fellow Deepak Ray, the study team developed geographically detailed maps of annual crop harvested areas and yields of maize (corn), rice, wheat and soybeans from 1961 to 2008. It found that although virtually all regions showed a yield increase sometime during that period, in 24 to 39 percent of the harvested areas (depending on the crop) yield plateaued or outright declined in recent years. Among the top crop-producing nations, vast areas of two of the most populous -- China and India -- are witnessing especially concerning stagnation or decline in yield. "This study clearly delineates areas where yields for important food crops are stagnating, declining, or never improved, as well areas where yields are still rapidly improving," Ray says. "As a result, it both sounds the alert for where we must shift our course if we are to feed a growing population in the decades to come, and points to positive examples to emulate." Interestingly, the researchers found that yields of wheat and rice -- two crops that are largely used as food crops, and which supply roughly half of the world's dietary calories -- are declining across a higher percentage of cropland than those of corn and soybean, which are used largely to produce meat or biofuels. "This finding is particularly troubling because it suggests that we have preferentially focused our crop improvement efforts on feeding animals and cars, as we have largely ignored investments in wheat and rice, crops that feed people and are the basis of food security in much of the world," said study co-author and IonE director Jonathan Foley, professor and McKnight Presidential Chair in the College of Biological Sciences. "How can we meet the growing needs of feeding people in the future if one-third of our cropland areas, in our most important crops, are not improving in yield any more?" The paper suggests two actions based on its findings. First, it recommends working to maintain the positive trajectory for the 61 to 76 percent of croplands where yield is still climbing. Second, it encourages crop-producing regions around the world to look at their yield trends and those of others to identify what's working and what might be improved. "Previous research suggests that many factors work together to limit yield growth, from cultivation practices to pests to a need for improved seeds," Ray said. "What this paper does is provide concrete, detailed information policy makers can use to identify regions where yield growth has stagnated or reversed, figure out what limiting factors are at play, then work to turn that trend around."